Eminem’s music publisher wants a bigger slice from Apple. Eight Mile Style LLC and a co-plaintiff, Martin Affiliated LLC, are suing Apple Inc., claiming they never authorized the use of 93 songs in a downloadable format on Apple’s popular iTunes service. The non-jury trial is expected to start Thursday in the rapper’s hometown of Detroit, unless a settlement is reached Wednesday with the help of U.S. Magistrate Judge Virginia Morgan. Eight Mile also is suing Aftermath Records, which controls the recordings in question, saying it didn’t have the right to make deals on digital downloads. 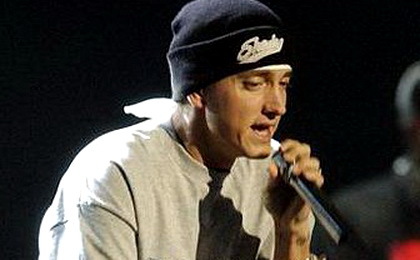 It’s unclear from court documents just how much money is at stake, but the plaintiffs claim Apple wrongfully gained $2.5 million through iTunes downloads, including $466,915 from “Lose Yourself,” Eminem’s biggest hit from the hip-hop film “8 Mile.” The publisher also believes it should get a share of Apple’s profit from the sale of iPods. Eight Mile also claims Aftermath wrongfully collected $4 million off Eminem’s songs on iTunes. Apple denies the allegations and says it has a valid agreement with Aftermath Records. Eight Mile has received royalties but says that doesn’t mean it can’t press ahead with a lawsuit. The “acceptance of a single check containing mostly royalties for authorized uses, but also containing small and hidden royalties for unauthorized uses, cannot operate as a satisfaction of a claim,” Eight Mile’s lawyers said in a recent filing in federal court. Eight Mile says it still retains ownership, including copyright, of the compositions inside Eminem’s recordings. If the case isn’t settled, the trial before U.S. District Judge Anna Diggs Taylor will center on how to interpret contracts. Eight Mile agreed in 1998 and 2003 that “Eminem would create master sound recordings embodying compositions, and that Aftermath would own those masters,” Apple’s attorneys said in a court filing. “The parties also agreed that Aftermath and its distributors and licensees would ‘have the exclusive right’ to exploit the masters embodying the Eminem compositions ‘in any and all forms of media now known or hereinafter developed,'” the lawyers said. Howard Hertz, a lawyer for Eight Mile, declined to comment on the case Tuesday. A message seeking comment was left with Daniel Quick of the Apple/Aftermath legal team. It’s unknown if the rapper would attend a trial if there is one. Eminem, whose real name is Marshall Mathers, is not on the witness list. Next Next post: Happy birthday to you – Google ?